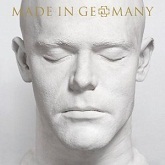 Review: "Rammstein: Rammstein-Made in Germany, 1995-2011" - Sea of Tranquility - The Web Destination for Progressive Music! If I were stranded on an island and had the opportunity to bring with me 100 albums of my choosing, I feel confident in saying that Rammstein would not make the list. However, as much as the multi-platinum selling powerhouse fails to stimulate my musical palette, there is absolutely no denying both their popularity and their ability to craft dynamic music that grabs the attention of even the most disinterested listener. With that said, Rammstein will release their 16-year retrospective,Rammstein - Made In Germany, 1995-2011, on December 13th, at a time when the band appears to be drawing a new legion of fans, as indicated by a flurry of excitement on the web over the two-CD/ three-DVD set, as well as the 21-date U.S. tour, which kicks off on April 20 at Fort Lauderdale, Florida's Bank Atlantic Center. As it stands, 2012 is shaping up to be a big year for Till Lindemann and company, who, in this retrospective, present to the world a remastering of their best and brightest songs, including "Amerika," "Engel," "Ich Will," "Ohne Dich," and the ever-popular "Du Hast." Also included in this set is the hard-hitting "Mein Land," Rammstein's first single in almost two years, and what I would consider a return to the guitar-heavy sound found on 2001's Mutter. I'm unaware as to whether or not this return was a conscious effort on the band's part, but the combination of driving guitars and political-esque lyrics, I believe, really does capture the essence of what Rammstein is all about. There are, however, a few fan-favorites missing from this collection, including "Reise, Reise," "Das Modell," and "Buck Dich," but given the amount of material that you're getting, there's little room for complaint. I especially enjoyed Disc-2, which features 17 tracks remixed by the likes of Faith No More, Meshuggah, Pet Shop Boys, and Clawfinger, just to name a few. I was not able to view the three DVDs that complete this set, but I'd imagine that 46 music videos and making-ofs would be of great interest to the Rammstein enthusiast. On the whole, this is a nice little package of goods, and a deserved retrospective for one of the world's biggest and most controversial bands. Super Deluxe Edition: Limited to 1200 copies in the U.S.
Packaged in a steel box complete with a 240-page booklet.